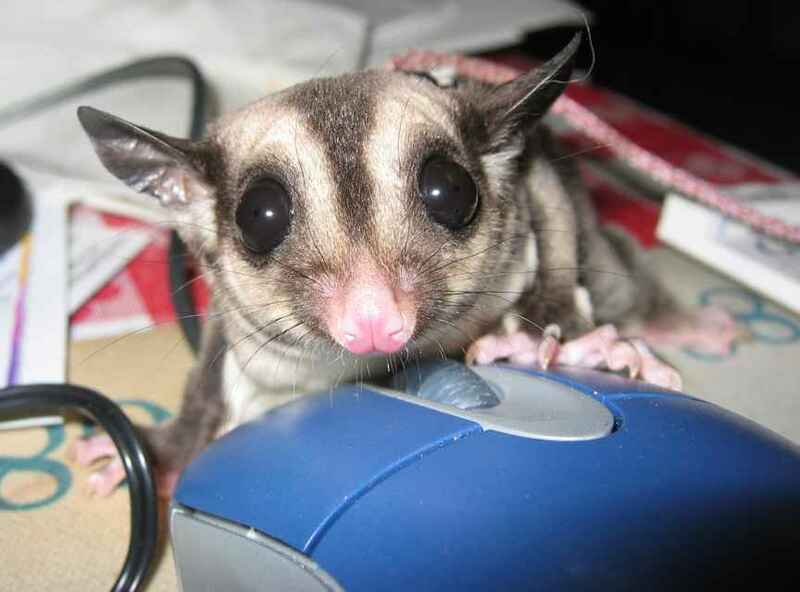 I first saw a Sugar Glider about 5 years ago. I fell in love but wifey said Nyet! Five years later, wifey is gone and again I fell in love at first sight when I saw a breeder set up at a flea market. This time I brought Joy home. 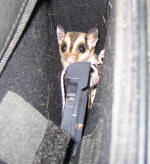 Joy is a female Glider that as of this date (08/09/05) is about 7 weeks old. She was hand-raised and therefore tamed to me almost instantly. I've owned rabbits and squirrels and other small critters. I've never seen a small one that bonded to its owner as fast as Joy did. Within a week of getting her, she would come to the door of her cage when I opened it and would sit on my shoulder or in my pocket for hours on end. Truly a pocket pet! 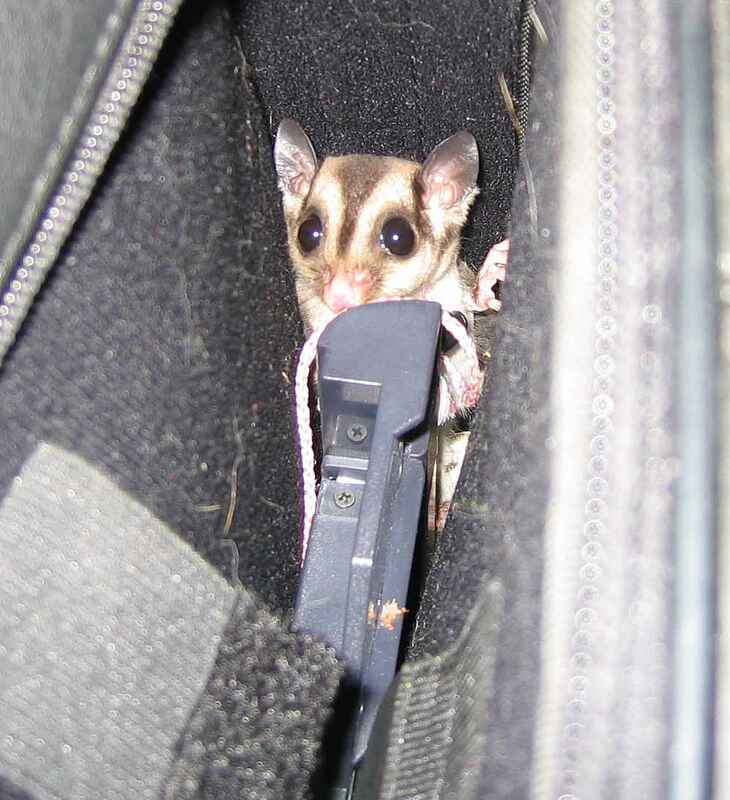 Sugar Gliders are flying marsupials (have pouches like kangaroos) that are native to Australia. 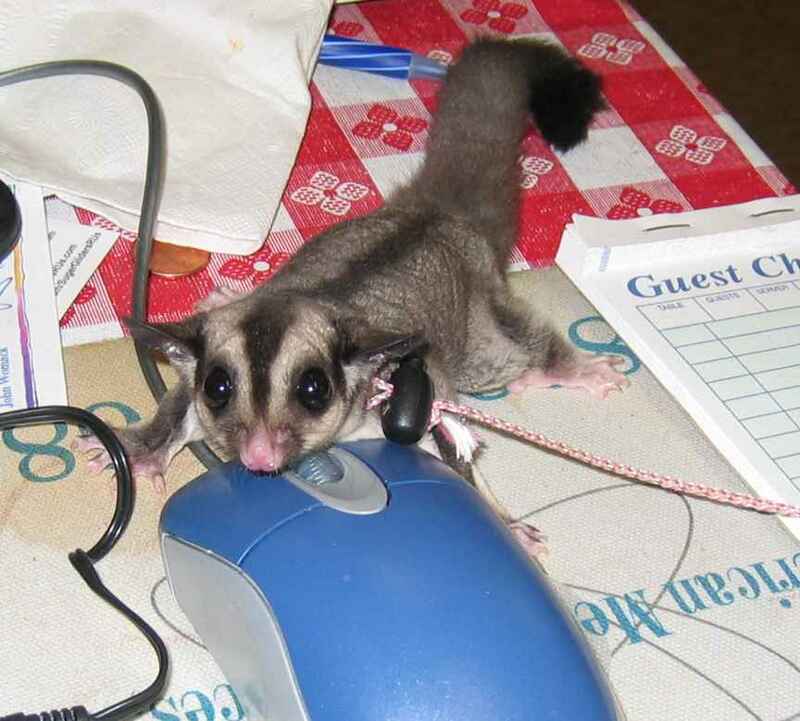 Even though the Glider looks like a rodent, it is a member of the Possum (not the same as the US O'possum) family. The young are born just a few days after conception and spend the rest of the gestation in a pouch in the mother's belly. The "sugar" refers to their almost insane love for anything sweet. In the wild they live in treetops and live on fruit, nectar, gum sap from trees, and occasionally smaller animals. A true omnivore. 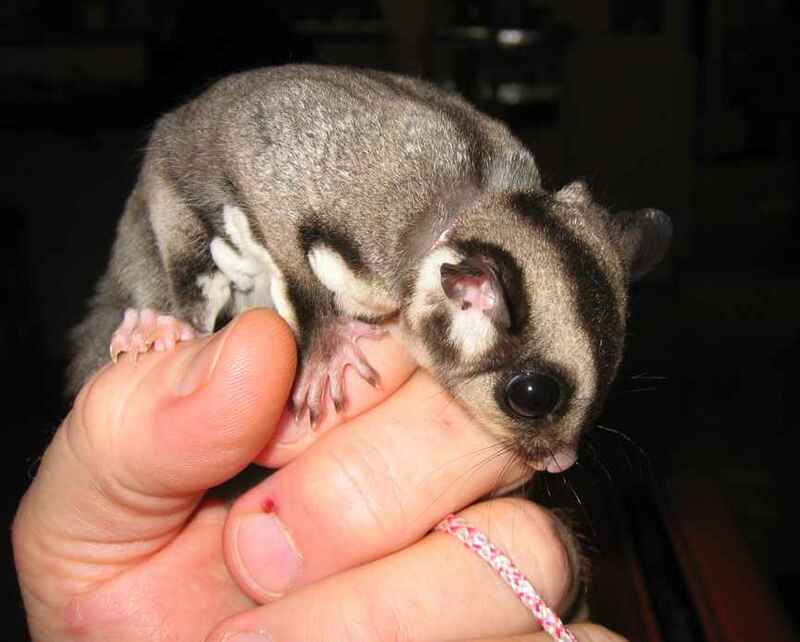 These little critters glide (fly) like the American Flying squirrel. It has a web of flesh that extends from its wrist to its ankles. It can glide for hundreds of feet, usually in pursuit of insect snacks. An interesting feature is that the Glider has opposable thumbs on all 4 "hands". They really do use their paws as hands. The rear feet grasp objects while the front are used to explore things and to hold food while eating. In captivity, their diet should consist of about 75% fruits and carbohydrates and 25% protein. I feed ordinary fruits from the grocery store, glider pellets and meal worms for protein. Gliders are prone to calcium deficiency so I water with a fruit juice/honey/water mix that contains Calcimate, a calcium fortifier designed to go in the water of reptiles. I also sprinkle a calcium supplement onto her dry food. 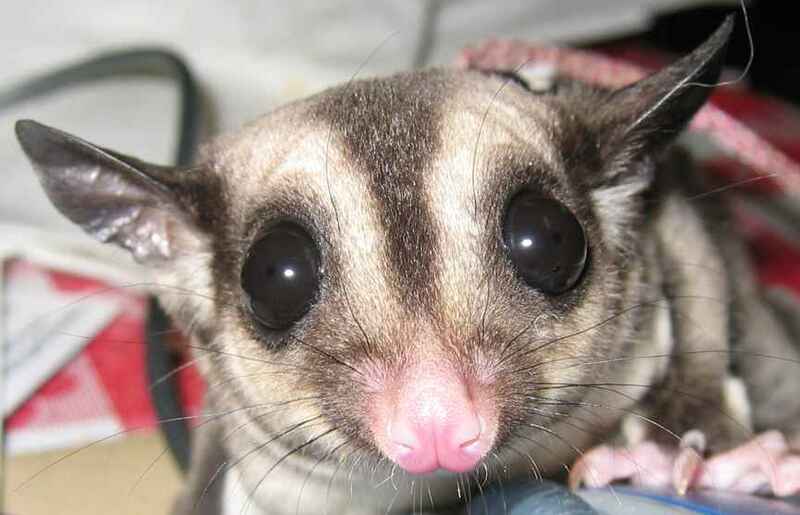 Gliders have fantastic hearing and vision and use their gliding skills to home in on and eat flying insects such as moths. Their ears can be steered like a cat's which aids in homing in on the prey. Unlike bats, their sonar is passive and homes in on the beating of the insects' wings. 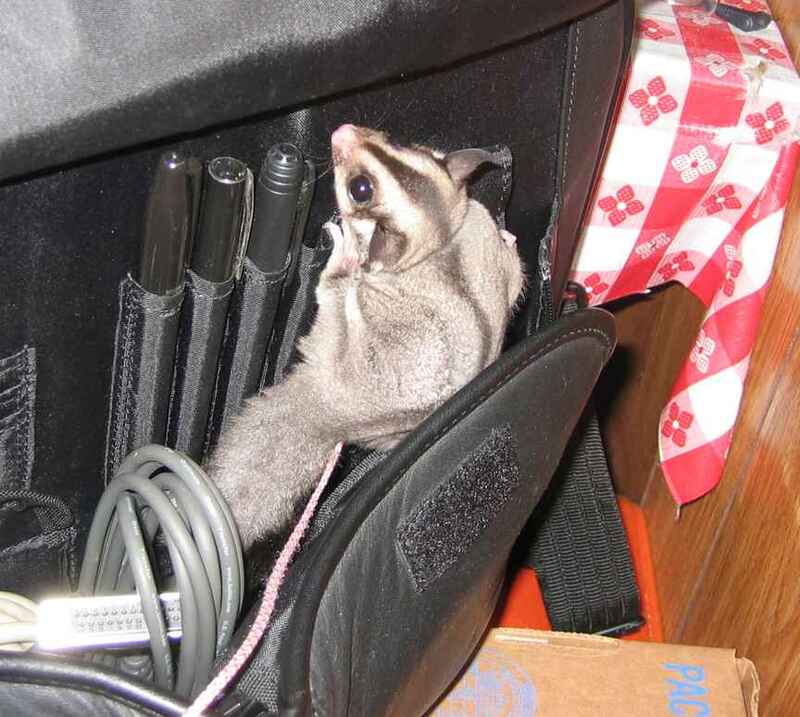 Probably one of the best things about Gliders for the small apartment dweller is that they are almost odorless. Any waste odors indicate an improper diet. The urine has a faint fruity odor for a little while after discharge and then becomes odorless. The male gets a slight odor during mating season.. On the proper diet, the poop is dry and practically odor-free. I'm just starting my photo collection of Joy'isms so the initial album is short. Enjoy the following. I'm sad to say that I lost Joy shortly after the birth of her first baby. The only thing I can figure is that something went wrong during the gestation. 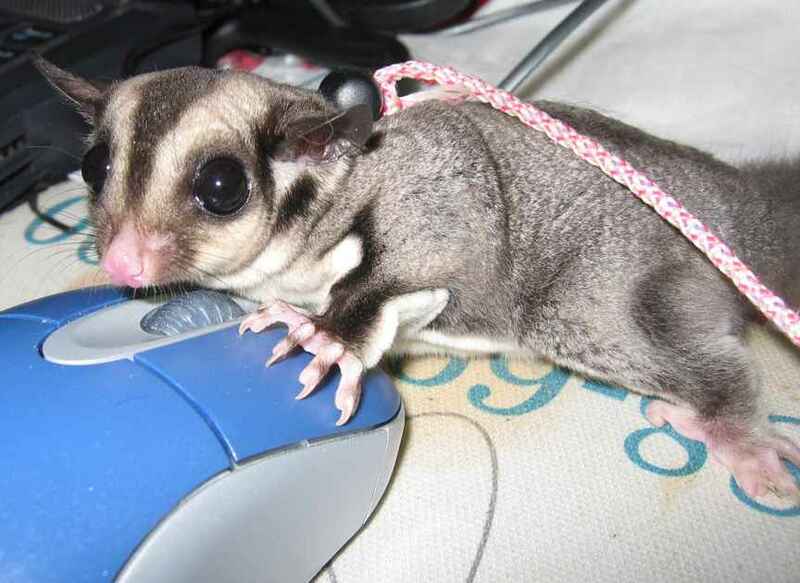 Other Glider experts have suggested maybe a genetic defect that also caused the tiny underweight kit. Joy's Showing a real interest in my computer stuff. My laptop bag to be specific. More Laptop bag snooping. The l'il Clicker. 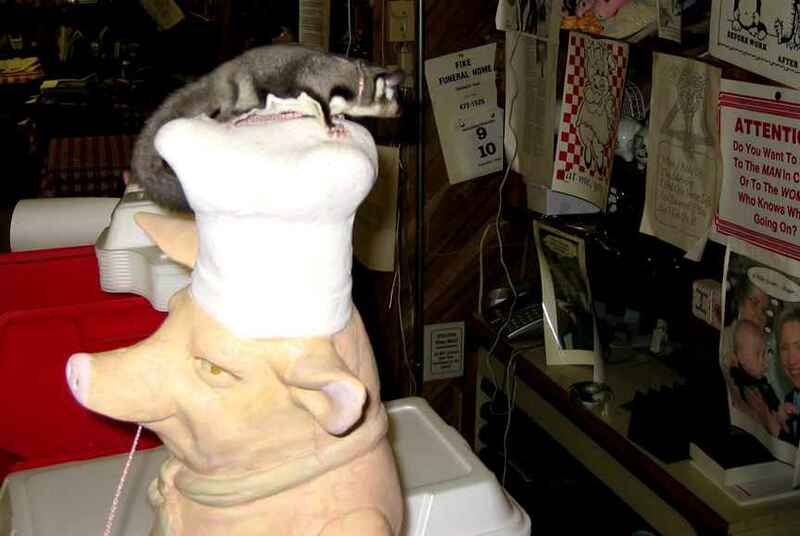 Just mousin' around. I have the clicks mastered but this wheel is a problem.